In theology, the doctrine of divine simplicity says that God is without parts. The general idea of divine simplicity can be stated in this way: the being of God is identical to the "attributes" of God. In other words, such characteristics as omnipresence, goodness, truth, eternity, etc. are identical to God's being, not qualities that make up that being, nor abstract entities inhering in God as in a substance. Varieties of the doctrine may be found in Jewish, Christian, and Muslim philosophical theologians, especially during the height of scholasticism, though the doctrine's origins may be traced back to ancient Greek thought, finding apotheosis in Plotinus' Enneads as the Simplex. God has no spatial parts (spatial simplicity). God has no temporal parts (temporal simplicity). God is without the sort of metaphysical complexity where God would have different parts which are distinct from himself (property simplicity). In other words, property simplicity (or metaphysical simplicity) states that the characteristics of God are not parts of God that together make up God. Because God is simple, God is those characteristics; for example, God does not have goodness, but simply is goodness. Spatial simplicity is endorsed by the vast majority of traditional Christian theists (who do not consider God to be a physical object). Temporal simplicity is endorsed by many theists but is highly controversial among Christian theologians. Property simplicity, which Morris describes as the property of having no properties, is more controversial still. In the medieval era, theologians and philosophers held to a view called "constituent ontology" whereby natures were actual constituents of things. In fact, an individual nature was more like a concrete object than an abstract object. Thus, one person's humanity was not, in this sense, the same as another person's humanity; each had his own individual human nature which was individuated by the matter out of which each man was composed. 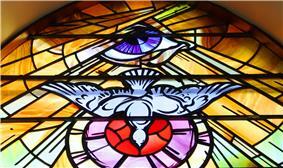 for entities which are immaterial, like angels, for example, there is no matter to individuate their natures. So each one just is its nature. Each angel is therefore literally one of a kind. Theologians holding the doctrine of property simplicity tend to distinguish various modes of the simple being of God by negating any notion of composition from the meaning of terms used to describe it. Thus, in quantitative or spatial terms, God is simple as opposed to being made up of pieces, present in entirety everywhere, if in fact present anywhere. In terms of essences, God is simple as opposed to being made up of form and matter, or body and soul, or mind and act, and so on: if distinctions are made when speaking of God's attributes, they are distinctions of the "modes" of God's being, rather than real or essential divisions. And so, in terms of subjects and accidents, as in the phrase "goodness of God", divine simplicity allows that there is a conceptual distinction between the person of God and the personal attribute of goodness, but the doctrine disallows that God's identity or "character" is dependent upon goodness, and at the same time the doctrine dictates that it is impossible to consider the goodness in which God participates separately from the goodness which God is. Furthermore, according to some , as creatures our concepts are all drawn from the creation (the assumption of empiricism); it follows from this and divine simplicity that God's attributes can only be spoken of by analogy — since it is not true of any created thing that its properties are identical to its being. Consequently, when Christian Scripture is interpreted according to the guide of divine simplicity, when it says that God is good for example, it should be taken to speak of a likeness to goodness as found in humanity and referred to in human speech. Since God's essence is inexpressible; this likeness is nevertheless truly comparable to God who simply is goodness, because humanity is a complex being composed by God "in the image and likeness of God." The doctrine has been criticized by many Christian theologians, including John S. Feinberg, Thomas Morris, William Lane Craig, and Alvin Plantinga, who in his essay Does God Have a Nature? calls it "a dark saying indeed." Plantinga gives three arguments against divine simplicity. First, he argues our concepts can apply univocally to God, even if our language to describe God is limited, fragmentary, halting, and inchoate. He argues that when we have a concept of something like being a horse, we know what it is for something to be a horse. The concept applies to an object if that object is, in fact, a horse. If none of our concepts apply to God, then it is sheer confusion to say there is such a person as God, and yet God does not have properties such as wisdom, being the creator, and being almighty. In fact, God would not have any properties for which we have concepts. God would not even have properties such as existing, being self-identical, or even being the referent of the term 'God.' If God transcends human experience, then we can say something univocal about God, since such a claim presupposes that we know what it means to transcend human experience, and that it applies to God. The claim that God can only be described analogically is, as Plantinga describes, a double-edged sword. If we cannot use univocal language to describe God and argue against simplicity, we are equally handicapped when it comes to the arguments for divine simplicity. If we cannot rely on our usual modes of inference in reasoning about God, we cannot argue for the conclusion that God is not distinct from his properties. Plantinga concludes "This way of thinking begins in a pious and commendable concern for God's greatness and majesty and augustness, but it ends in agnosticism and in incoherence." Plantinga also gives three criticisms of the doctrine of metaphysical simplicity directly, stating that it is exceedingly hard to grasp or construe the doctrine, and it is difficult to see why anyone would be inclined to accept it. First, the Thomist doctrine of simplicity states that all abstract objects are identical with God's essence and hence God himself. Plantinga states that this seems to clash with the obvious fact that the property of being a horse is distinct from the property of being a turkey and both are distinct from God and his essence. Secondly, Plantinga argues, if one restricts the realm of abstract objects that are identical with God to only the properties that God exemplifies, the doctrine is still problematic. Metaphysical simplicity states that God has no accidental (i.e. contingent) properties. Yet, it clearly does seem that God has accidental properties such as having created Adam, and knowing that Adam sinned. Some of God's characteristics characterize him in every possible world and some do not. Plantinga also argues that the conflation of God's actuality with his potentiality inherits all the problems of the essence-accident complexity and is furthermore vexed in its own right. Just as it seems there are characteristics that God has but could have lacked, it also seems the case that there are characteristics that God lacks but could have had. No doubt God has not created all the persons he will create. If so, there is at least one individual essence such that God does not now have, but will have the characteristic of causing that essence to be instantiated. If so, God has potentiality with respect to that characteristic. Plantinga's third critique challenges the very heart of simplicity. Metaphysical simplicity claims that there is no divine composition, meaning that there is no complexity of properties in God and that he is identical with his nature and each of his properties. There are two difficulties with this view. First, if God is identical with each of his properties, then each of his properties is identical with each of his other properties, so God has only one property. This flies in the face of the idea that God has both power and mercifulness, neither of which is identical with the other. Secondly, if God is identical with his properties, then, since each of God's properties is a property, it follows that God is a property as well. In this case, God has just one property: himself. The problem is that properties do not in and of themselves cause anything. No property could have created the world, and no property could know anything at all. If God is a property, then he isn't a person but a mere abstract object, having no power, life, love, or even awareness. Craig calls property simplicity "philosophically and theologically unacceptable." He also states that divine simplicity is open to powerful objections. On the doctrine of divine simplicity, God is absolutely similar in all possible worlds. Since the statement "God knows x" is equivalent to "x is true," it becomes inexplicable why those worlds vary if in every one God knows, loves, and wills the same things. Morris states that it is an idea whose implications are difficult to defend and whose advantages can be had in other ways. It is also an idea whose motivation, under close scrutiny, is not so convincing. John S. Feinberg concludes: "These philosophical problems plus the biblical considerations raised earlier lead me to conclude that simplicity is not one of the divine attributes. This doesn't mean that God has physical parts, but that the implications of the doctrine of metaphysical simplicity are too problematic to maintain the doctrine." According to Maimonides, there can be no plurality of faculties, moral dispositions, or essential attributes in God. Even to say that God is all-knowing, all-powerful, and all-good is to introduce plurality, if one means thereby that these qualities are separate attributes. Maimonides therefore concludes that it is not true to say that God's power is greater than ours, that God's life is more permanent than ours, or that God's knowledge is broader than ours. Maimonedes believed that statements such as "God lives" or "God is powerful" are nonsense if they are interpreted in the normal fashion, but they can be understood if one analyzes them as disguised negations. Still, Maimonedes also believed that negation is objectionable to the degree that it introduces complexity: God is neither this nor that, and ultimately any kind of verbal expression fails us. Citing Psalm 65, Maimonides concludes that the highest form of praise we can give God is silence. Some identify Divine simplicity as a corollary of Divine Creation: "In the beginning God created the heaven and the earth" (Genesis 1:1). God, as creator is by definition separate from the universe and thus free of any property (and hence an absolute unity); see Negative theology. Despite its apparent simplicity, this concept is recognised as raising many difficulties. In particular, insofar as God's simplicity does not allow for any structure — even conceptually — Divine simplicity appears to entail the following dichotomy. On the one hand, God is absolutely simple, containing no element of form or structure, as above. On the other hand, it is understood that God's essence contains every possible element of perfection: "The First Foundation is to believe in the existence of the Creator, blessed be He. This means that there exists a Being that is perfect (complete) in all ways and He is the cause of all else that exists." (Maimonides 13 principles of faith, First Principle). The Kabbalists address this paradox by explaining that “God created a spiritual dimension… [through which God] interacts with the Universe... It is this dimension which makes it possible for us to speak of God’s multifaceted relationship to the universe without violating the basic principle of His unity and simplicity” (Aryeh Kaplan, Innerspace). The Kabbalistic approach is explained in various Chassidic writings; see for example, Shaar Hayichud, below, for a detailed discussion. Rigorous views of Divine Simplicity were championed by the Mu'tazili, which resulted in a radically apophatic theology. By postulating a distinction between Existence and Essence for all created beings, which was perceived to be uniquely absent in God, Al-Farabi established another model of Divine Simplicity. Ibn Sinā supported and elaborated this position, Al-Ghazali contested this identification of Divine essence and existence, but still saw all Divine attributes and acts as enveloped in and indistinct from the Divine Essence, this latter view of Divine Simplicity was shared with some of the most trenchant critics of the Muslim philosophical writers, like Ibn Taymiyyah. ^ Plotinus, Second Ennead, Ninth Tractate, Section 1 (MacKenna's translation, Sacred Texts). Burell, David. Aquinas: God and Action. London; Routledge & Kegan Paul, 1979. Burell, David. Knowing the Unknowable God: Ibn-Sina, Maimonides, Aquinas. Notre Dame: Notre Dame University Press, 1986. Brower, Jeffrey. "Making Sense of Divine Simplicity", Faith and Philosophy 25 (1) (2008): 3-30. Dolezal, James. God without Parts: Divine Simplicity and the Metaphysics of God's Absoluteness. Eugene: Pickwick Publications, 2011. Dolezal, James. "Trinity, Simplicity and the Status of God's Personal Relations", International Journal of Systematic Theology 16 (1) (2014): 79-98. Leftow, Brian. "Is God and Abstract Object?". Nous. 1990. Maimonides, Moses. The Guide of the Perplexed, trans. M Friedländer. New York: Dover, 1956. Plantinga, Alvin. Does God Have a Nature?. Milwaukee: Marquette University Press, 1980. Plotinus. Enneads V, 4, 1; VI, 8, 17; VI, 9, 9-10. . Many editions. Pseudo-Dionysius. The Divine Names in Pseudo-Dionysius: The Complete Works, trans. Colm Luibheid. New York: Paulist Press, 1987. Radde-Gallwitz, Andrew. Basil of Caesarea, Gregory of Nyssa, and the Transformation of Divine Simplicity. Oxford: Oxford University Press, 2009. Stump, Eleonore and Kretzmann, Norman. “Absolute Simplicity”. Faith and Philosophy. 1985. Thomas Aquinas. )De Esse et Essentia (On Being and Essence, 2nd ed., trans. Armand Maurer, CSB. Toronto: Pontifical Institute of Medieval Studies, 1968. 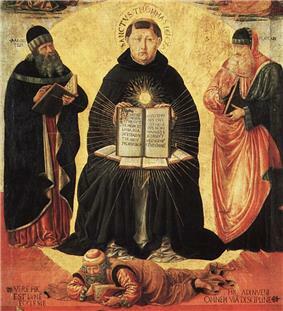 Thomas Aquinas. I, Q. 3, A. 3 "On the Simplicity of God"Summa Theologica. Many editions. Weigel, Peter. Aquinas on Simplicity: An Investigation into the Foundations of His Philosophical Theology. Bern: Peter Lang, 2008. Wolterstorff, Nicholas. "Divine Simplicity", In Philosophical Perspectives 5: Philosophy of Religion. Atascadero, Calif.: Ridgeview Publishing, 1991, 531-52. - The Gate of UnityShaar HaYichud, Dovber Schneuri - A detailed explanation of the paradox of divine simplicity.